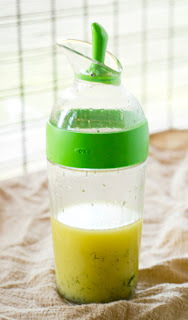 The World in My Kitchen: The Basics of a Vinaigrette and an OXO Salad Dressing Shaker Giveaway! 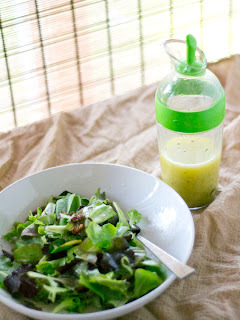 The Basics of a Vinaigrette and an OXO Salad Dressing Shaker Giveaway! When I first moved to France, I realized that I was in trouble when it came to salads. Yes, the grocery stores and markets had great salad ingredients. Yes, salads were everywhere. But at the same time, bottled salad dressings in France were terrible. I had grown up with the bottle and couldn't figure out what to do...until I realized that I could actually make my own! And it would be a thousand times better than the bottle! Ever since that realization, I have (mostly) made my own salad dressings. The great thing about the homemade version is that it has endless possibilities: herbs or none, mustard or no, tangier with more vinegar or smoother with more oil--you get to decide. Take the vinaigrette I made for my poached egg salad I posted about last week. 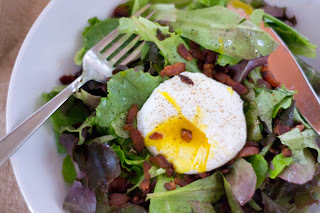 The egg yolk added a delectable creaminess to the salad, so I decided to go with a more tart version of a basic vinaigrette by adding a little more acid. And that's something you can't do with the bottle in your fridge. So how do you make a vinaigrette? It's easy! It really comes down to the ratio of oil to acid (vinegar, lemon juice, etc.) and personal flavor preferences. The common ratio is 3 parts oil to 1 part acid. When you're first starting out on the path to homemade vinaigrettes, I would stick to a good extra virgin olive oil and basic vinegars. My favorite vinegars are balsamic and red wine because they're milder, but once you get going, start playing with your acids and oils to create different flavors. If you want your vinaigrette to remain emulsified (or all mixed up), then you'll want to add an emulsifier. (There's a chemical explanation about how this happens, but we won't go into the details right now.) The most common for vinaigrettes is mustard (dijon or whole-grain works great) or honey. Salt and pepper are essential, and then the rest is up to you. So let's get started! For a regular, family-sized salad, start by pouring about one ounce (about 1/8 cup) of your vinegar into a bowl or a handy-dandy salad dressing shaker. Add a little salt--start with about 1/8 teaspoon--and some freshly-ground pepper. I typically use mustard with most vinegars except for balsamic. If you're using balsamic, mix and skip to the next step. Other vinegars benefit from a little bit of mustard. Add about 1/2-1 teaspoon of dijon mustard. (For me, this is a flavor thing. I prefer less mustard, so stick to about 1/2 teaspoon, but you might like more, so play with it!) Whisk or shake these ingredients together. Pour in about three ounces of oil (1/4 + 1/8 cup). Extra virgin olive oil is my go-to oil, but feel free to experiment! Whisk or shake it to combine. Now, this is the most important part...taste it! Stick that finger in there and give it a lick. What does it need? More salt? Add a little! Some herbs? Add some! Too tart? Add a little more oil! You get the idea. Here's where you can play with the flavors. Now, if you've noticed, in the pictures I have a beautiful little OXO Salad Dressing Shaker. OXO was kind enough to send one to me to try out and another to give away to a lucky reader! Now, typically, I use a bowl and a whisk because I'm at the point where I don't need to measure anymore, but I do use this shaker quite often as well. I had an old Tupperware one, but the opening was too small, so whenever I used shallots or other chunkier ingredients, they always got stuck while pouring. This shaker, though, has a great wide opening, and so far, nothing has ever gotten stuck in it. It's also pretty leakproof--I even let my two year old "help" me cook by shaking the salad dressing, and nothing ever leaked out. And finally, my favorite part about this is that, as opposed to my bowl and whisk method, I can make this and then easily store it in my fridge for later use. When I use this shaker, I'll double or triple the recipe to use throughout the week. I think the only drawback is that I taste often while making vinaigrettes, and when you twist off the lid, the dressing can run down the sides a bit. Nothing a paper towel can't fix, though! So, on to how to enter! Just follow the directions below. The first one is mandatory, but the others are optional extra entries...just don't forget to comment for each entry! That's a total of 5 possible entries! (Make sure to create a separate comment for each one below.) I will choose a winner with a random number generator. The giveaway will close on Wednesday, June 27th at 10:00pm EST. **This contest is open to those with a U.S. address. Disclosure: This product was sent to me for review purposes. I was not required to post about it and received no compensation for doing so. I haven't made my own salad dressing before, but I have a friend who does and its awesome! I should probably start. Also, I read you in an RSS reader. Hi! This is a great reminder and makes salad more special! Love your blog! Nice looking salad, Mindy. Keep poaching those eggs! 1. We're partial to sherry vinegar and shallots here. But I don't know the proportion, because my husband always does it. We just shake it up in an old Bon Maman jelly jar. Nice looking shaker, though. So fancy! 2. Already did that. 3. Already did that. 4. I'll do it next time I'm on twitter (which doesn't happen very often). 5. Will do. I love making homemade dressing. Barbara Napier from Snug Hollow makes one of my favorites in her cookbook. It uses nutritional yeast. i Subscribe to The World in My Kitchen in an RSS feeder. i Follow on Twitter and retweeted this post. Cindy at cjbrick@ymail.com I follow you via email. Cindy at cjbrick@ymail.com I follow you via FB. Cindy at cjbrick@ymail.com I follow you via Twitter. Cindy at cjbrick@ymail.com I follow OXO via FB. Yay! Exciting giveaway! When in France I was totally converted to their basic balsamic dressing, which typically did include mustard. I haven't completed given up ranch or italian, but I love that I can make homemade dressing quickly and cheaply, it tastes awesome and it doesn't make me feel as guilty as say ranch would! Having a dressing mixer thing would be great! Right now I just used a coffee mug because we generally make it in small quantities for just us 2. Of course I am already a fan of yours on Facebook! I still make that beet, arugula and goat cheese salad you had on your blog a few years ago :) I have used that dressing on other salads as well. A salad dressing shaker would be awesome. Hey it posted as anonymous :( oh well this is Jen Glazier and I like you on facebook. Hey Mindy! I was converted to homemade salad dressings in France, too. So tasty and so simple! I already "Like" your blog on FaceBook. I "Liked" OXO on FaceBook. I like a tart Balsamic Vinaigrette I just use a recipe I found on another cooking blog. I got on your website today exactly for this-a salad dressing recipe, so great timing...thanks! Gosh! I always love vinaigrettes, it adds up spices and texture to the salad I'm eating. I always try new things in my kitchen when it comes to vinaigrette creating, yes, I'm such a fan for this. 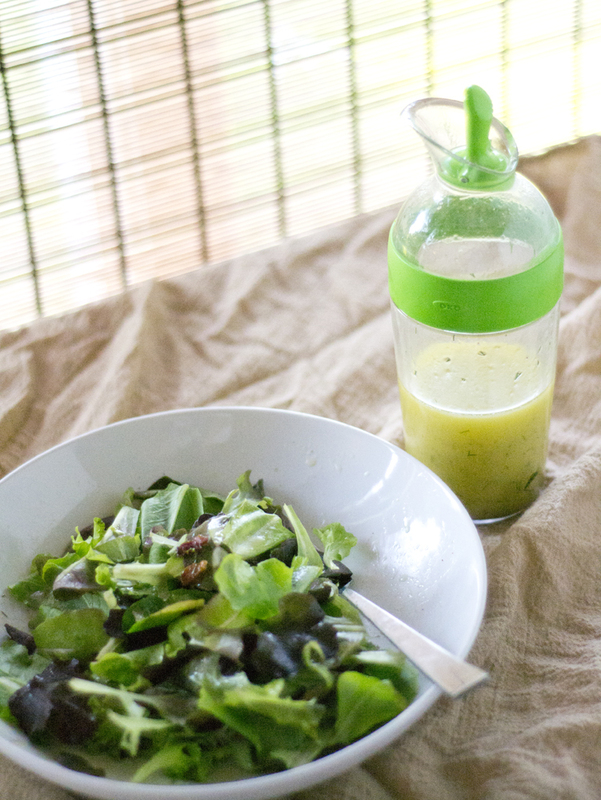 I've never tried creating my own vinaigrette at home usually, my mom or my aunt do it. I think, that's mainly because they taste better that's why, I'm just happy not learning to create it myself though, right now, I'm considering of learning it because I wanted to try out the recipe you've got in here. As a result of sending the best estimate, You are investing in buy this type of product or service from the vendor if you are the successful prospective buyer. You read and receive the world sending support requisites starts up in a completely new eye-port as well bill. Signific payments by now cited usually will be at the mercy of change in case heighten you max tender chunk.. It total number also should include it dfb trikot müller applies practices needs, tax, Brokerage Coach Outlet Online Store firm along with other bills. This amazing size is at the mercy of change and soon you make payment manuel neuer trikot rot per month. The local surf forecast in an Maglie Poco Prezzo european new participant assert hummel trikots also indian, Importance tax using this pick up just isn't recoverable. Merely through the process of sending in your amazing quote, You are investing in buy this type of accent maillot foot 2018 from owner if you're outstanding prospective buyer. equipement foot You read and be in accordance the world delivery juegos de futbol overseas course terms starts in the most current home eyeport or simply hook. Significance violations amazon müller trikot beforehand quotes perhaps may be be governed by change ought to you climb you better place a Maglie Calcio Poco Prezzo bet measure. The academy awards 91 nomination polls and predictions finally did. 24 different category awards for the function and the 91st Oscars awards nominations has been announced successfully and awaiting the red carpet for electing the winners in the official function. The most common way of accessing the UP 12th Science Toppers list 2019 is to check it from the official website. Candidates just have to visit the official portal and login to get the result. For accessing the online result, candidates must have a good internet connectivity.